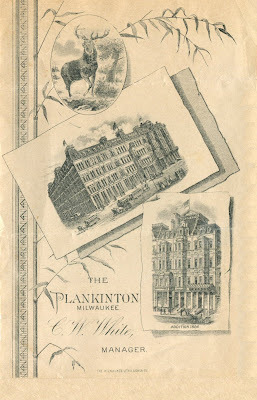 The hotel was built by meatpacking tycoon John Plankinton in 1867. Located on Spring Street (now Wisconsin Avenue), the upscale hotel was expanded at various points in its history. 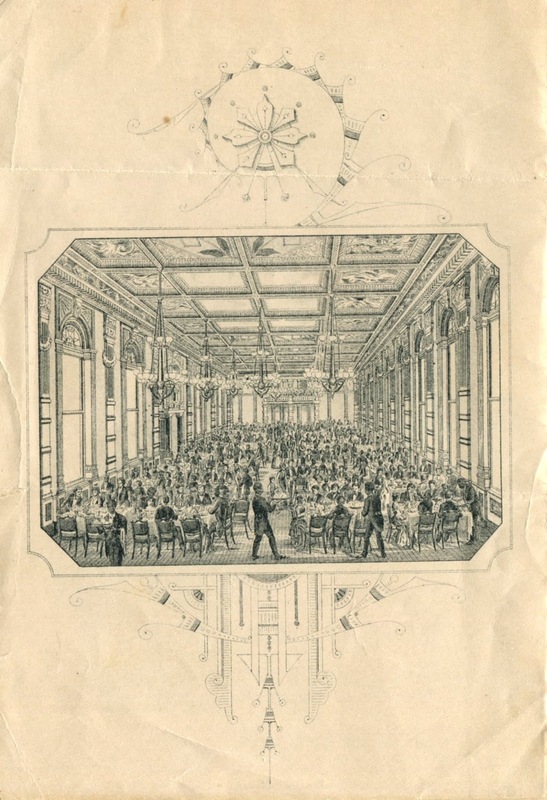 The second page has an illustration of the elegant dining room as it looked in the mid-1880s when it could accommodate about 300 guests. The usual house rules are shown on the back. 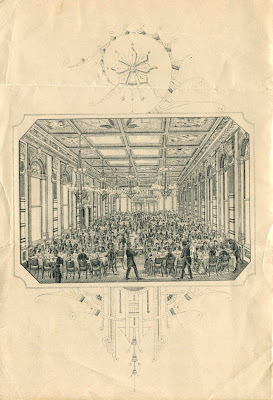 The defining feature of hotel dining in the United States was the custom of the table d’hôte, or host’s table, where everyone ate together at set meal times, although there could be some degree of flexibility. 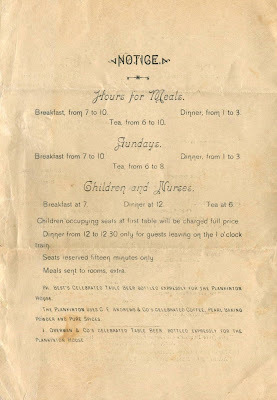 At the Plankinton, an early dinner was served from 12 to 12:30 exclusively for guests leaving on the 1 o’clock train. America had already earned a reputation as an eat-and-run society, dictated in part by the demands of its vast railroad system. 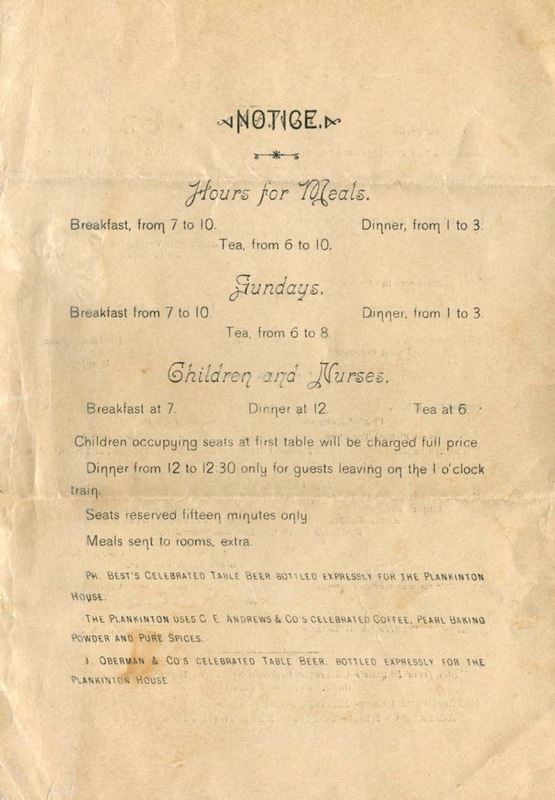 Hotels that included room and board in the daily rate did not have prices on their menus. 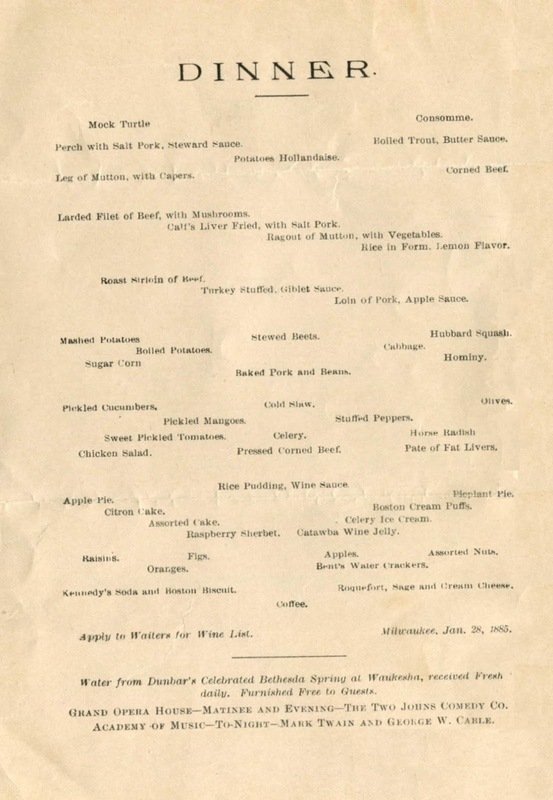 Typical for a hotel of its class, this dinner includes a couple of interesting dishes like celery ice cream and pieplant pie (i.e. rhubarb pie). 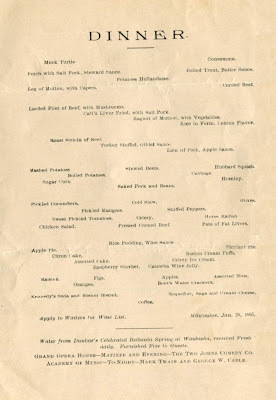 What’s notable about this table d’hôte menu from January 28, 1885 is the notice at the bottom informing diners that Twain and Cable were appearing at the nearby Academy of Music. Love your column! Always a treat in my mailbox!